You cannot think of an everyday necessity as widely used as the spoon. But when it comes to your precious little one, the challenges in eating with a spoon are many. Most spoons are meant for adults and are therefore far too big for a kid’s mouth. Then, there are teething troubles which lead little ones to chew on whatever is near their mouths. Add to that all the mini-tantrums a baby will throw when it comes to mealtimes, and you know that unless the spoon you use to give your child that mouthful of food is created explicitly for him or her, there is really no way he or she is going to eat at all! The best baby spoons in the market are both ergonomic and ignite the imagination of your baby. We round up the spoons that will leave your child happy and satisfied after each delicious meal. 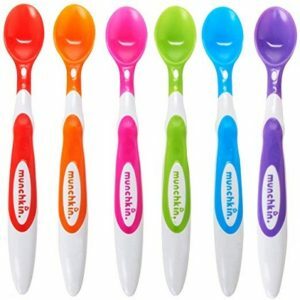 Take one look at these six bright hued spoons, and you’ll know why these are among the best kids’ spoons available. Not only is the handle designed so that both you and your tiny tot find it comfortable to hold, but the spoon-bowls are also soft on the baby’s mouth and promise never to hurt your baby’s developing gums. This kids’ spoon is dishwasher friendly. Load it on the top rack, and you can sit back and relax. The material used in these spoons is safe for your child — they are free of BPA and phthalate. Some reviewers say that the spoon bowls are a little deep for infants to scoop food up with their upper lips, even though the product is for three-month-old babies and up. The spoons are rather large, causing them to tip backward whenever rested on a bowl. The colors offer visual excitement to your child, and what’s more, the set is rather affordable. It’s the perfect baby spoon to get your child started on table manners. Your child may not have been born with a silver spoon in his or her mouth, but that is no reason not to ensure that his or her first ever spoon is one that will provide a fun eating experience that will be kind to sensitive gums. The best spoons for baby boys and girls are the ones that give them those perfect bite-sized portions of food and this one comes pretty close to doing just that. The spoon bowls are optimized to reduce choking hazards. 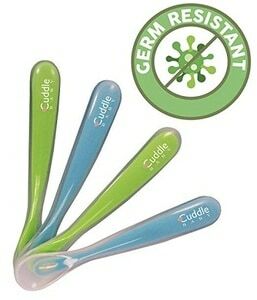 The high-quality silicone used to make these spoons are odor-resistant, bacteria-resistant and even hypoallergenic. Carrots will stain the spoon. However, the quality of the utensil will not be affected. These baby spoons, while dishwasher safe, are not sterilization-safe. Nothing will encourage your child to begin self-feeding like this non-toxic, friendly-looking kiddie spoon which is designed primarily to be held by a tiny tot’s adorable little hands. Even your fussy child will find mealtimes interesting with these fun spoons! Ever slumped back on your chair during mealtime when your child just won’t let a spoon near his or her mouth? Here comes a kids spoon that knows precisely what it is like for new parents struggling to get their baby to eat just that one mouthful that will not hurt their gums. Made of sturdy silicone, the spoon can withstand nearly all the dinner table tantrums that your little one might throw at it! BPA free, the spoons are the perfect choice to begin training your child to portion food while eating. They are extremely soft and will not hurt the baby should he or she decide to bite down on the edges while eating. The spoons cannot be used as a substitute for teethers. One of the best infant spoons on the market, its superior quality makes it a cut above anything else that might be on offer. Additionally, the spoons are also lightweight and just perfect for your infant’s firm grip. Finally, a baby feed spoon that is specially engineered to be shallow enough to make sure that just the right amount of food is picked up each time and there is no overfeeding or choking as a result. Soft and soothing, especially for teething babies, these spoons even help reduce the usual anxiety that kids face while teething. The spoon is perfect for both soft and solid foods. The set can be used through infanthood and on to the pre-schooling age. Some food items will stain the clear silicone part of the spoons. This is one of the best spoons for baby boys and girls who are transitioning into solids from liquid food and eager to teach themselves how to eat. The set is also affordable and lasts long, even though the spoons are eminently chewable! What do all the best kids’ spoons in the market have in common? These spoons are specifically designed keeping in mind the knowledge that for your tiny tot, you are prepared to get the best, the safest, and the most baby-friendly items available. 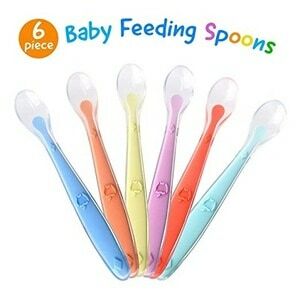 Babies will find the bright colors of these kids’ spoons interesting while the ergonomic design will ensure that you can get the food into your baby’s mouth with ease. The soft tip prevents the baby’s delicate lips and gums from getting hurt during mealtimes. Babies can be picky eaters, so choosing the right spoon can help you make the mealtimes a tad less stressful. So say goodbye to tears and bawling babies during mealtimes and instead, welcome the prospect of your baby laughing through his or her yummy lunch with these baby spoons.